In 1890 a 20-ton block of Colorado white granite settled into place on the corner of Lincoln and Pennsylvania streets, the site that would soon become the home of the Colorado State Capitol. Four years later, the legislature finally moved in to occupy the grand building modeled, by architect Elijah Myers, upon the federal capitol building in Washington, DC. 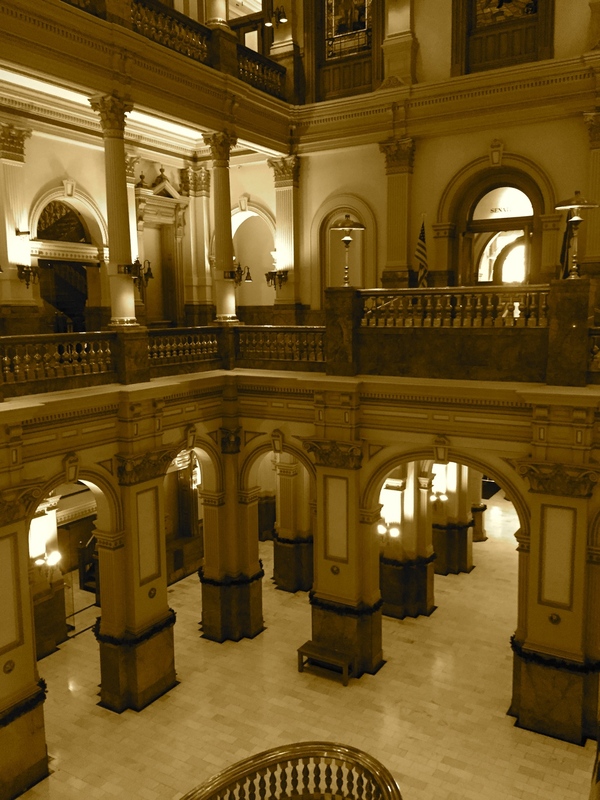 The building has since stood proudly, bearing witness to the history and daily life of the state's past 120 years. I hopped on the bus outside my house for an afternoon of civic contemplation and exploration in Colorado's center of government. About a dozen or so others (including Finns and Peruvians!) joined the tour group for a quick 20-minute circuit through the historic building. We started in the West Wing, home of the governor's office, where current brewer-turned-governor John Hickenlooper conducts the business of Colorado. Contentious issues under recent debate have focused on gun control (in the wake of the Aurora theatre shooting) and natural gas and energy exploration in the state, especially the practice of fracking. From Governor's wing we entered into the 18-story tall central dome of the capitol. On the first floor, eight historic mural panels by one of my favorite Western painters, Allen Tupper True, line the circular room, each one depicting an important aspect of the relationship between humans and water in the west. The bottom of the rotunda is a great vantage point from which to see the materials used to engineer the state capitol, many of which tell unique Colorado stories. The floors, fashioned from Yule marble, was mined from the aptly named town of Marble, Colorado, and is the same stone selected to construct the Lincoln Memorial in Washington, DC. Ornamented pillars and fixtures throughout the building use brass to add some luster to the decor. Rose onyx wainscoting lines the corridors and was mined outside Pueblo in the south of the state. It is so rare that all of the known deposit was used up in the construction of the capitol. The upper portion of the capitol, including the girdings of the dome high overhead, uses iron. The dome itself, composed primarily of copper, is plated in gold leaf - about $120,000 dollars of the stuff with a tissue paper-thinness of 1/800 of an inch! Re-gilded in 2013 using just 4 pounds and 11 ounces to cover the entire surface, the locally-mined gold traveled to Utah and Italy for expert purification and milling before returning to grace the dome. Our group ascended the grand staircase to the second floor where we peeked inside the Old Supreme Court, a room of warm crimson walls and dark wood. No longer a judicial space, the room is now dedicated to various legislative committee hearings that are always open to the public. We next viewed the floor of the House of Representatives but did not enter as passage is restricted only to sitting members. Proceedings here can be publicly viewed, however, from the galleries above. In the rotunda space on the 2nd floor of the capitol is the Hall of Presidents where original portraiture of our country's top elected executives ring the room. Each image was painted by the same artist until his death in 2003, when the torch passed to another artist. A narrow stairwell climbs from there to Mr. Brown's Attic, site of the Capitol Museum with wall displays presenting the chronology, history, and cultural identity of the state capitol building. The attic is named for Henry Cordes Brown a prominent Colorado businessman of the time who donated the property on which the capitol was built. He also built the nearby Brown Palace Hotel, another Denver landmark. My favorite aspect of the modest museum is the John Glendenin painting, "The Confluence" that shows the initial settlement of Denver at the confluence of Cherry Creek and the South Platte River. But the highlight of the tour, if one is of stout enough heart and muscle, is the 99-stair climb through the insides of the capitol tower to the observation deck in the dome. Standing on the catwalk ringing the inside the dome, I surveyed 16 stained glass likenesses of influential Coloradans in the Colorado Hall of Fame, an odd place for this tribute considering the effort required to view the display. Above the ring, tall windows display the state of Colorado outside. Views stretch west to the highest 14ers of the Front Range and East across broad plains. It also gives a one-of-a-kind view of the nearby downtown Denver skyline. The tour leader left our group to enjoy the views on our own and to find our way safely back to the main halls of the capitol. I spent some time wandering the corridors again to snap pictures and admire the architecture. At the bottom of one of the stairwells, I found a door unintentionally propped open that led into the sub-basement of the capitol building. Stepping cautiously into the old stone halls I knew I shouldn't be in this area of the capitol and imagined the guard stations and closed circuit cameras in the building all sounding the alarm that an intruder had breached the defenses. But no one came running. I walked tentatively into the low-ceilinged hall and recalled a recent ghost story shared by local historian Phil Goodstein during a recent Halloween evening walk in Downtown Denver. Legend has it that Felipe and Vivian Espinosa, a pair of outlaw brothers, terrorized Coloradans in frontier San Luis Valley back in the 1860s, murdering dozens of pioneers. Then-governor John Evans was so angry with the brothers that he placed a bounty on their heads- which were summarily obtained bv a bounty hunter. The heads were presented to Governor Evans, pickled in alcohol, and stored in the sub-basement where they eventually vanished. Employees working after-hours now report seeing the floating heads in the steam tunnels below the capitol. Others describe hearing the sound of echoing hoofbeats galloping up and down the rotunda stairs as the headless ghosts of the Espinosa brothers search for their decapitated heads. I moved slowly down the underground hall, growing anxious that I might get lost and suddenly find myself face to head with one of the Espinosas! Thankfully I quickly found a doorway that exited to a recessed alcove on the east side of the capitol building. Outside now, I wandered back around to the west side where the official mile-high marker is placed on one of the capitol steps. Finishing my tour of the building here I felt that the experience had provided me with a richer sense of place and a better understanding of the old and new history of Denver and Colorado. There is already a fascinating collection of stories and surprises to be found at the state capitol. And without a doubt, new stories and surprises will be found in the years to come under that shining golden dome. 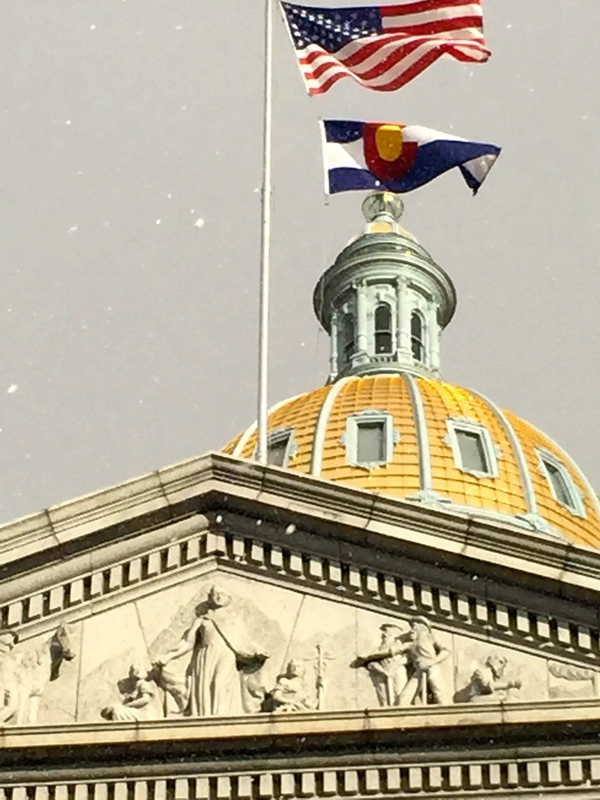 The Colorado State Capitol tours are free of charge and the building is open from 7:30 AM until 5:00 PM on weekdays. Tours happen each hour on the hour between 10:00 AM and 3:00 PM. The building is closed on weekends and legal holidays. For more detailed contact information and other aspects of the tours, click here. Parking can be difficult to come by near the capitol as it is either reserved for legislators or metered for a limited time. Consider parking on the west side of the 16th street mall area and taking the free 16th Street MallRide to the Civic Center area and the Colorado State Capitol. Other points of interest in the area include the Central Library, the Denver Art Museum, The US Mint, and the Molly Brown House. After the tour, browse for more local history at Capitol Hill Books on the corner of Colfax and Grant, a local institution with a broad selection of used books about Denver and Colorado. Thumb through your new purchase at the Shish Kabob Grill , located kitty-corner to the bookshop, while munching a gyro sandwich and guzzling a Mexican Coca-cola. The trail to Cub Lake starts on a gentle path that traces a wide ridge of rock with long views across the open expanse of Moraine Park. Two large herds of elk lazily fattening up on forbs and grasses for the winter months ahead served as a reminder that this was a special place: Rocky Mountain National Park. Founded in 1915, the coming year will mark 100 years for one of our country's natural crown jewels and I won't take it for granted that I can visit this place on a weekday afternoon in October and find sixty degree weather and empty trails. From Moraine Park, the trail climbs steadily through beaver meadows to an area burned by fire just a couple short years ago; a fire made notable by the fact that it took place in December, well outside the typical fire season, and the fact that I happened to have been in Estes Park at the time and was evacuated by the Sheriff's office early one morning due to the danger. 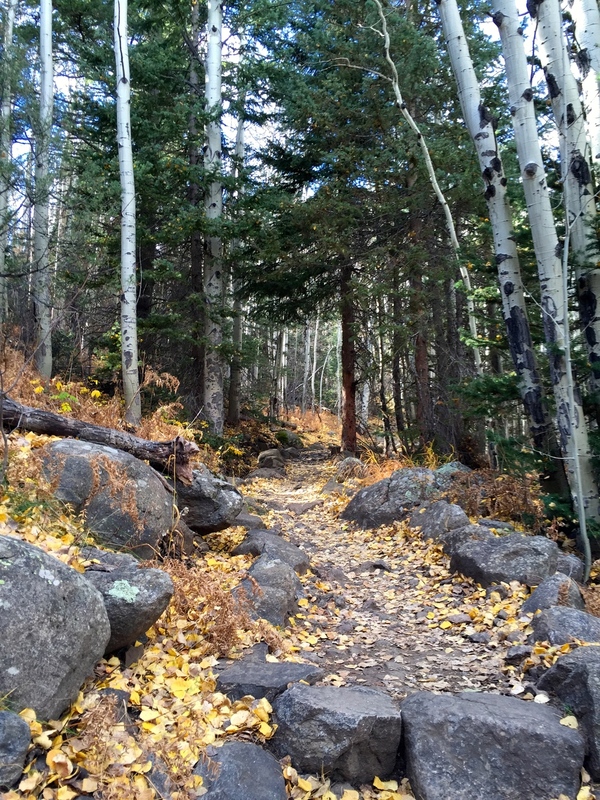 Among the blackened conifer trunks, aspen trees stood bare, having already shed their golden coats for the season, dropping them to the soil where they lay today, decomposing into the earth and filling the air with the aroma of Autumn. The leaves ruffled underfoot, water gurgled in hollows under glacial rocks and the wind sighed. This segment of trail wound gracefully up to Cub Lake, so natural in its path that it seemingly did not require effort on behalf of human hands, a true credit to those who actually did endure the sweaty toil of making this footpath. The trail reached over a rise to a meadow at the east end of Cub Lake and the wind, carrying a high mountain rawness as it so often does here, slashed against me and had me wondering if starting this run in only a t-shirt and shorts may have been too optimistic. But I ran into the wind. 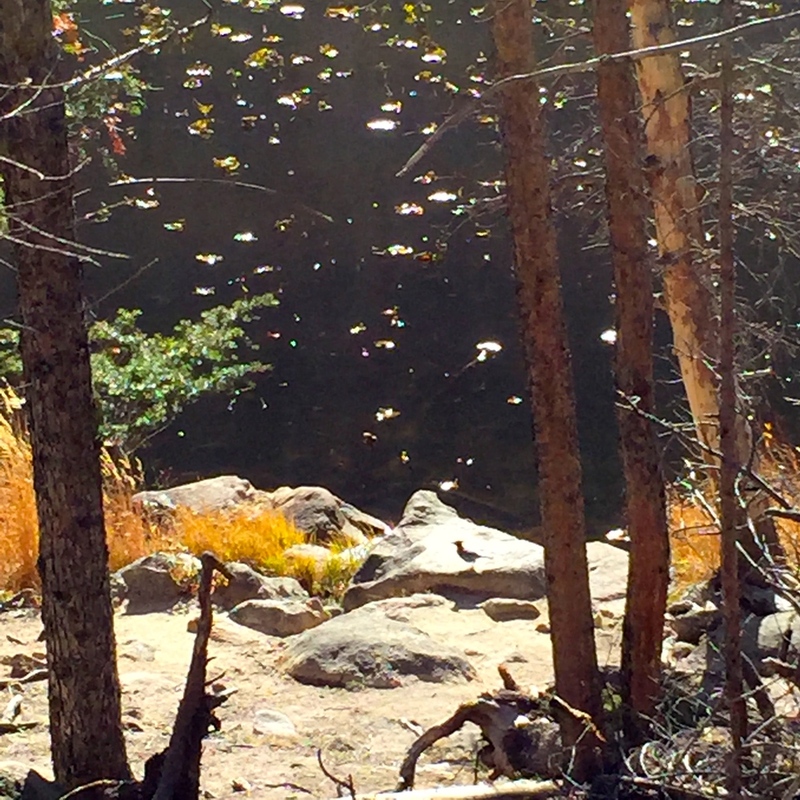 Cub Lake glimmered gold behind the trees, a colorful beatitude to the warm sun above, while a Steller's Jay flitted from branch to branch in the living trees left unharmed by the recent beetle kill and fire. Above, Stones Mountain glared down from the heart of the park, dark and gray under clouds it had drawn up around it's broad frosty shoulders. Running the burn through this area under the darkening skies and surrounded by the skeletal trees and the bone-white rock felt spooky, perhaps as much from the coming of Halloween, as from the trail conditions themselves. Summoning the courage to descend through this segment of trail brought me to The Pool, a swollen stretch of the Big Thompson River crossed by a rebuilt heavy bridge so new that the sawdust still filled the nooks and crannies of the planks. I paused here to admire the mountain scenery, but only briefly as Stones Mountain had continued piling up it's cloudy cap and tiny sprinkles of rain tickled my backside the whole way down the buffed trail that followed the course of the Big Thompson River. I passed under arched Rocks and on to the Fern Lake Trailhead where less than a mile of easy running on the road returned me to the Cub Lake Trailhead and gave me the unique satisfaction of a tidy loop run rather than an out-and-back. A run like today's makes clear the inadequacy of the written word to justly describe a day in the wild. So I hope you will go. And see. And run into the wind. To get to the Cub Lake Trailhead, go north on I-25 to exit 243. Travel west on Hwy 66 through Lyons to US 36 into Estes Park and following signs to Rocky Mountain National Park. The park currently has a $20 entrance fee which can be paid at the Beaver Meadows Entrance Station or annual passes can be purchased for $80. Once inside the park take the left turn at Bear Lake Rd and a right onto Moraine Park Rd after 1.25 miles. Follow Moraine Park Rd for .5 miles, then take a left onto Fern Lake to the trailhead on the left after 1.25 miles. An adventure in a place as rugged as Rocky Mountain National Park should be celebrated at a place that is equally as rugged. The Rock Inn Mountain Tavern is just outside the Beaver Meadows entrance and serves up a tasty char-broiled buffalo burger, sweet potato fries, and cold beer on tap. During the fall, try Isolation Ale, a seasonal winter warmer from Odell Brewing company just down the road in Fort Collins. An afternoon storm blew out of the mountains yesterday, and helped determine the extent of my recreation, cutting short my anticipated ride but not at the sacrifice of great scenery and fresh air. There is a fine urban ride that links the three premiere parks of Denver together that w in great shape after the rain, bright with well-tended flower beds, open lawns, and mature trees to enjoy throughout the ride. I set off south on my road bike going along the paved carriageway that loops around Washington park, passing over irrigation canals, beside reflecting lakes and ponds, under leafy canopies, and around ball courts and picnic areas that compose a park so classically designed that it has been recognized as one of "America's Great Public Spaces". The rain had seemed to clear out some of the usual runners, roller skaters, dog walkers, and cyclists that fill the park at all times, leaving the wide roadway relatively open. The wet asphalt shined the rubber of my skinny tires but still felt grippy and secure while pedaling. At the North end of the park, I turned out of the entrance onto Marion Street where a bike lane afforded me plenty of elbow room once I left the more controlled setting of the park. The road bends around the high hedges and brick walls of the Denver Country Club along smooth concrete and continues to Speer Boulevard. From there, I crossed Speer to enter the Country Club Historic Neighborhood and with a right on 3rd a left on Gilpin, a quick right onto 4th and finally one more left on to Williams I entered the heart of this vintage area of landscaped medians and large homes in the Mediterranean style and the American Foursquare style of architecture (a favorite of mine). Dried leaves under my tires signaled that the first day of Autumn had just passed a few days before and the branches would soon be bare. Williams Street led right into Cheesman Park, and I followed the park road counter-clockwise past the distinctive pavilion and the fence line of the Denver Botanic Gardens to the west of the park. Leaving the park on Franklin and crossing busy Colfax to 16th guided me in to East High School and City Park. 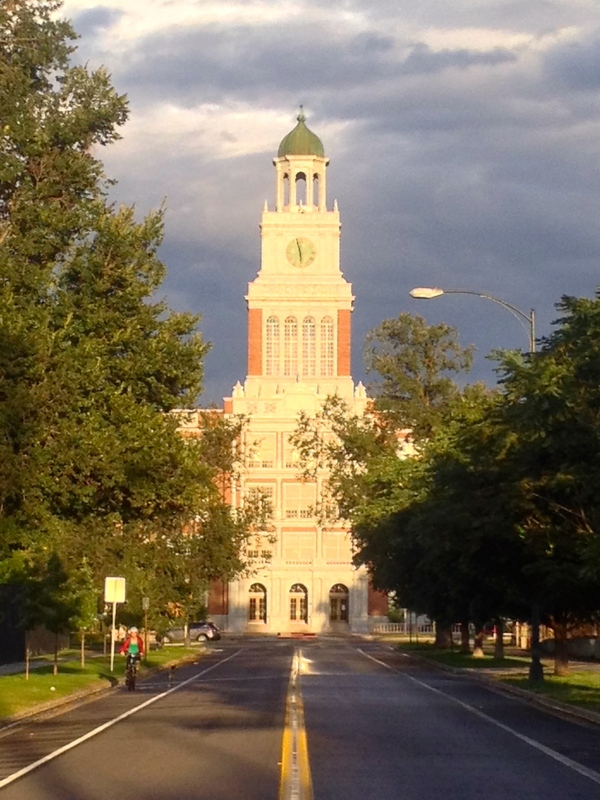 East's clock tower, modeled after Independence Hall in Philadelphia glowed in the setting sun as I turned north below to follow the Esplanade into the third park of the journey. Built during the City Beautiful era of landscape architecture at the turn of the 20th century, City Park is a worthwhile stop for both visitors to, and residents of Denver. Surrounded by the Denver Zoo, the Museum of Nature and Science, and a variety of shops and restaurants, a whole day can be easily absorbed by the distractions included in the park and its neighborhood. I stopped to admire the view across Lake Ferril, the fountain a shimmering spray of gold. With the sun quickly sliding behind the Rockies I quickly completed the loop through City Park and retraced my route back through Cheesman Park to Washington Park before dark to close out a wonderful Colorado weekend. Three great parks and an hour of effort. Washington Park is easy to find by taking Speer Blvd to Downing and driving South. Turn into the Park at Exposition to start this ride. Any of the Parks can be enjoyed singly on foot as well. This ride is best at a leisurely pace where riders can stop to enjoy the views and parklands along the way. Let Chipotle and Qdoba battle it out for "most popular" of the Mission-style Burrito joints while the locals quietly enjoy the menu at fun, casual burrito joint Illegal Pete's. After the ride, refuel at their South Broadway location. I recommend the "Big Potato" burrito; it fills you up perfectly with crisped potatoes, a primavera vegetable medley and a selection of house-made salsas to dial in just the right heat!